Sedation dentistry is the use of medication and/or special tactics to help calm your nerves and take your mind off the sights, sounds, and other sensations of what is going on around you. It helps you feel more comfortable, and that means it is easier for your dentist to perform treatments more efficiently. You won’t need to take as many breaks when you feel completely at-ease, and it may be possible to complete longer treatments that would usually take multiple visits to the dentist in a single appointment. Healthy patients of all ages can benefit from some type of sedation dentistry. Dr. Morgan is pleased to offer a revolutionary option in sedation dentistry — it’s called NuCalm, and it works without the use of medication or controlled substances. 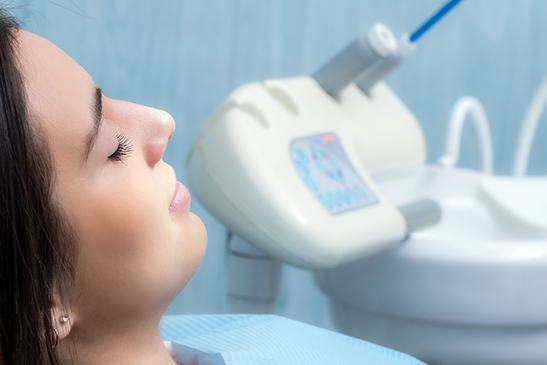 Traditional sedation dentistry can leave you feeling groggy for hours after the procedure, and the methods used may not be safe for patients who have dependency issues. NuCalm offers a better alternative. First, we will give you a tablet to chew that reduces adrenaline to help you relax. Then, a small patch is applied behind your ear — it provides a subtle wavelength of stimulation to take your mind off of what’s going on around you. Noise-cancelling headphones and dark sunglasses take care of the rest of the sensations you may experience at the dentist’s office. You aren’t put to sleep with NuCalm, but you’re completely relaxed and at-ease. That’s why it’s called NuCalm! Is NuCalm Sedation Dentistry Right for You? If you have ever avoided the dentist due to your dental fear or anxiety, NuCalm may be a wonderful solution for you. Because it does not require the use of strong medications, your dentist in Bullard can offer NuCalm to help keep you calm through any procedure — from checkups and cleanings to more in-depth treatments. Don’t wait to learn more about how it works! We look forward to helping you overcome your dental fear in 2018. Dr. Tad Morgan is the trusted dentist serving Bullard, TX families and friends. He is pleased to offer patients of all ages care with state-of-the-art tools and methods, including NuCalm sedation dentistry. To learn more about his services or to schedule an appointment, you are invited to contact the office at 903-825-1112.